Shopping in Phoenix’s southeastern suburbs for storage solutions, kitchenware, dorm bedding and home décor ideas? Get inspired and enjoy great values on all the brands you love at the Bed Bath & Beyond® store near you in Queen Creek; you’ll find it in the Queen Creek Marketplace on S Ellsworth Loop near the E Rittenhouse Rd. intersection. 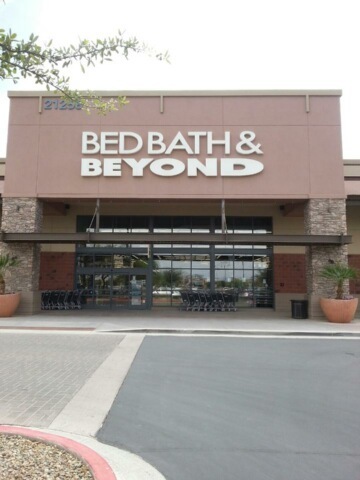 Whether you’re just passing through or have lived here for generations, it’s easy to get everything you need for your home at this convenient Bed Bath & Beyond® store located at 21258 South Ellsworth Loop Road, Queen Creek, AZ 85142; (480) 882-3418. Rated as one of the friendliest towns in the U.S., this location is staffed with friendly and knowledgeable associates who are ready to assist with your selections. Need gifts? In addition to basic housewares, this store has a nice gift selection. Use the gift registry feature to create a birthday registry, baby registry, anniversary registry or custom occasion registry.